Only downside? My hairline….but that’s a topic for another day. The Rare Disease Day Panel. It was a busy and fulfilling few days, but it wasn’t the end of my travels. 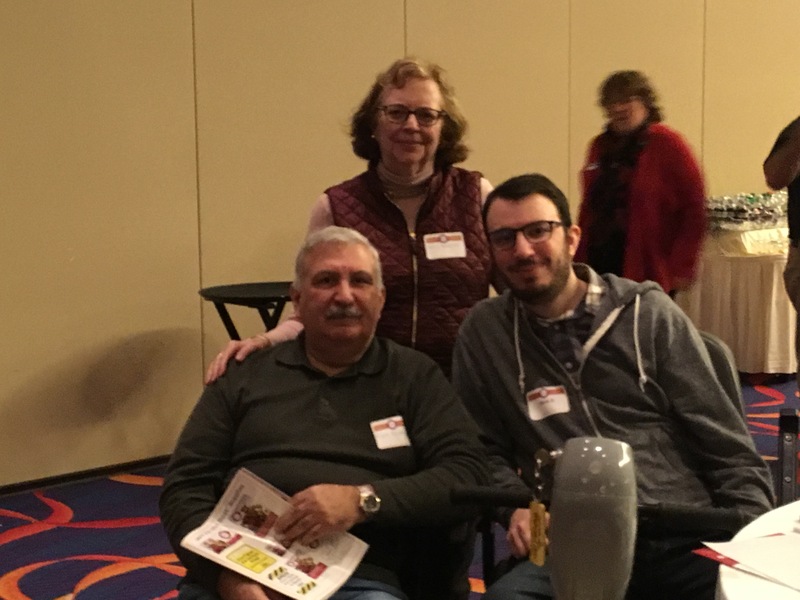 In early March, I was invited to attend the Muscular Dystrophy Association’s Clinical Conference taking place March 11-14 in Arlington, Virginia. MDA asked that I write about the conference from the patient’s perspective, for those unable to attend. I had done something similar four years ago at their conference in Chicago, and really enjoyed the experience. Although it was a last-minute invite, I was excited for the chance to go again. The only issue was logistics. Whereas four years ago I could hop on a plane and take care of myself, this time around I would need my parents to care for me. I would have to have their buy-in before I could say yes. I thought it would take some convincing, but it turns out they were just as excited to attend as I was, even though it was a seven-hour drive from Connecticut to Virginia. It didn’t hurt that there would be several presentations on research advances, which my parents were interested in seeing. It was a win-win for everyone. For me personally, I was excited to see how much had changed on the research front in the last four years. It turns out the difference is night and day. Back then, approved treatments were still a pipe dream, and clinical trials were only just starting to take off. Now, there are several approved muscular dystrophy drugs (I can’t remember the exact number – I think 6 or 8), with more on the horizon. Clinical trials are popping up for many different disorders. In addition, there have been great strides made in clinical care over the last four years, which will have a more immediate impact on my life than any drug. Listening intently at the MDA Clinical Conference. It was a whirlwind four days, and quite exhausting. I needed lots of coffee and frequent naps to get through it all. But it was worth it. Having the opportunity to listen in on the presentations, and getting the chance to meet different stakeholders and MDA staff was a great thrill. The experience took a lot out of me physically, from the drive down and back to sitting in a wheelchair for four days straight. I felt like a zombie after returning home, but eventually snapped out of it. Once I regained some semblance of energy, I typed up my experience at the conference, which you can find here. There was one other occurrence from the conference worth mentioning – I tried a power wheelchair for the first time. This deserves its own post, because it’s not something to be glossed over. The moment I sat in the chair and drove it for the first time was an emotional one. Frustration. Relief. Power. Self-consciousness. Surrender. I felt it all. But it had to happen, and I’m glad it took place at a muscular dystrophy conference, where no one would think twice about someone in a wheelchair. After recuperating for a couple weeks and recharging at home, I was off to another MDA event on March 29th. Every year, MDA has a “Boot Camp” for firefighters who participate in the annual MDA Fill the Boot campaign. The northeast Boot Camp event takes place every year at Mohegan Sun casino, about 20 minutes from my house. It is a great opportunity for firefighters from throughout the northeast to relax and have some fun, while learning about the Fill the Boot program. This year I was assigned to write a wrap-up of the day, similar to what I wrote for the Clinical Conference. When I attended a couple years ago, I spoke to the firefighters, so this was a more low-key assignment. Which was just as well, since I was battling a migraine all day. If I had to go up on stage with a pounding headache, I would probably have gotten sick. A nice lasting memory for the 500+ in attendance. Headache aside, I enjoyed the opportunity to meet firefighters from all over the New England and tri-state area, except for the ones that were wearing Philadelphia Eagles championship t-shirts. I have my limits after all. My parents and I (and some mystery woman in the background) at Fill the Boot Camp. In between my travels, I’ve found other ways to keep busy. My downtime has one distinct advantage – I am writing more now than I ever have. I’ve made great strides on my novel, which I will update you on in the coming weeks. I feel like I am gaining real momentum this time, rather than in the past, when I would write two pages and feel accomplished. In addition to the book, I’ve also received a lot of freelance work from MDA, and as of this month, Boston Children’s Hospital (link forthcoming), which I greatly appreciate. It keeps me busy, pays the bills, and gives me the opportunity to interview many wonderful patients throughout the country. These opportunities mean the world to me, and sometimes they create a ripple effect. Recently, I wrote a blog post for the Beryl Institute, an organization that focuses on improving the patient experience. I shared my patient story and wrote about how doctors oftentimes have the power to either encourage or crush patient dreams. I argue that a little encouragement can go a long way, as evidenced by my own life. Overall, it has been a busy month, with still more opportunities on the horizon, including consulting opportunities, additional freelance writing, and an appearance on the Optimize Yourself podcast. It’s an interesting time for me – exciting, but also a little confusing. It’s weird. On one hand, I have no idea what I want to do with my life, now that it’s been completely turned upside down by this disease. But on the other hand, as all these opportunities have shown me, I am on to something. I enjoy sharing my story, speaking, writing, meeting others. There is something to be said for all that. I knew this time off would be a learning experience, and although I don’t have all the answers yet that I seek, I know, at the very least, I am headed in the right direction. I just have to keep hope alive and trust that this will all work out in the end. God willing, I believe it will. You are an inspiration to all! Keep doing what you are doing.